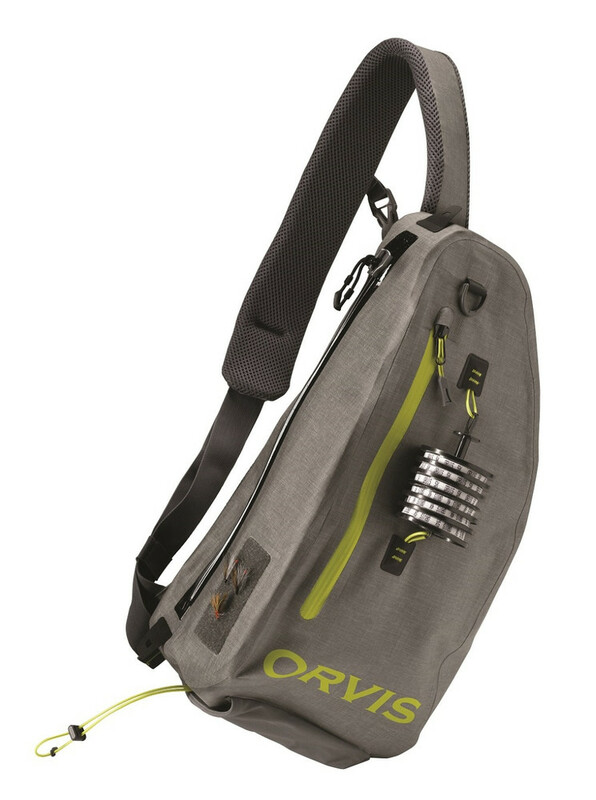 The first impression of the Orvis waterproof sling pack was extremely convincing. The material feels strong and durable with its 500D nylon. All seams are taped and I could not find any imperfection on the entire bag. The water bottle holder at the bottom has an elastic security cord to fasten it securely. This offers peace of mind that I will not accidentally lose the bottle. The holder is not for 1.5 litre bottles but works fine with up to 1.0 litre. A quick look into the interior was very promising too. The main compartment is very spacious with 14 litres in total. It has 3 little pockets, one of which has a zipper to hold, for example, your license and other things you would like to store flat such as leaders. The two other pockets have mash nets, which can hold up to medium-sized fly boxes. Larger fly boxes for streamers easily fit into the main compartment. Furthermore, the main compartment is also large enough to hold everything you need for a whole-day fishing trip with a DSLR and food. I loaded the Orvis sling pack with a mirrorless camera, 200mm lens, a waterproof case, a small water filter, some food and all I need to fish. Inside the main compartment, just on the other side of your back, is another Velcro strip. For this piece of Velcro Orvis offers the Silver Sonic waterproof pocket, which is translucent. This optional complement might save ones mobile phone when it accidentally goes for a plunge. The outer smaller pocket is closed with a water-resistant Reiss™ zipper. This pocket offers fast access to some other tools such as indicator wool. 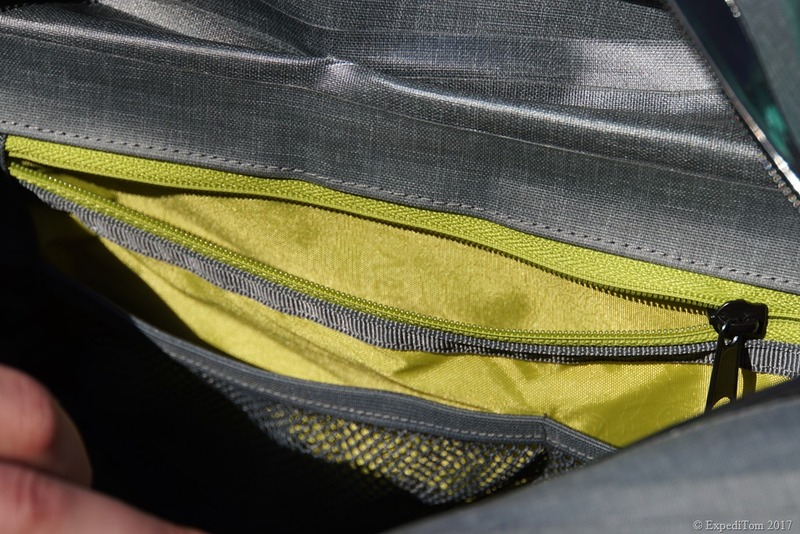 Keep in mind that the outer pocket is not waterproof in contrast to the main compartment. The sling pack has attachment points at the sling as well as on the back of the bag. At the sling, there is an insertion point for scissors or clamps. Moreover, there are several small holes to attach a retractor, which, for instance, holds an Amadou or a bottle of grease. On the back of the bag there are two tippet bar loops. The Orvis tippet bar fits perfectly into this space between these two strings. This allows to add tippet to the leader when putting the bag in front of you. This is very convenient and time-saving. Additionally, there is a Velcro patch right next to the waterproof YKK® Flexseal® zipper. The Velcro is thought to hold flies to dry after you have fished with them. However, only barbed flies seem to hold properly, which I do not use. Still, the Velcro is useful to attach for instance a rod holder or another retractor with a nipper to cut the tippet below. The design of the Orvis waterproof sling pack appeals to me very much. Although, I am not a fan of hi-viz colours for outdoor gear, the green colour of the logo is a good compromise between visibility and design. Even though it is bright, it is not UV active nor does it reflect light. Beside this, it is by far less flamboyant than the new Cusco colour by Patagonia. About the grey colour I am very pleased too. The grey is rather dull and camouflages anglers against many different backgrounds, which might result in a fish not spoked. The aforementioned waterproof YKK® Flexseal® zipper is impressive. According to YKK® it is waterproof up to 0.4 bar which withstands every downpour and short dip. The Flexseal® has a strong, flexible coil element offering a durable light-weight fully waterproof solution for the most demanding applications. For optimal performance, you should apply some silicon lubricant every now and then, store the zipper open when not in use and avoid direct sunlight. However, there is one downside to this zipper: The YKK® Flexseal® zipper needs two hands to open. Given that it is waterproof the zipper is stiff and therefore needs some force to open. Regarding the waterproofness, the sling pack’s main compartment is absolutely tight. No rain has entered while fishing, neither did salt water while swimming in the sea. However, as much as I trust waterproof bags, make sure you squeeze the bag before entering the water in order to test for any leaks where air can escape. 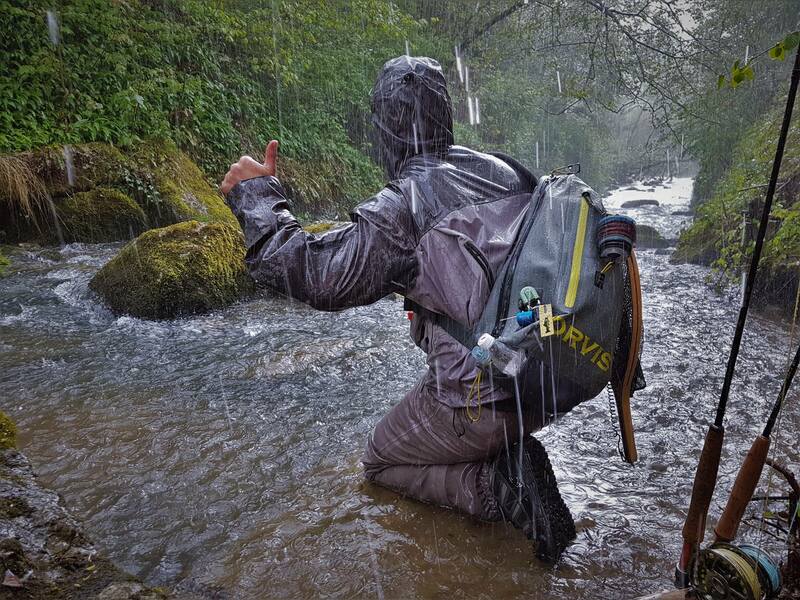 Thanks to the Orvis Waterproof Sling Pack we defied the weather and kept fishing. What striked me most about the new Orvis sling pack while fishing was the ease of use. You can reach the net easily. Surprisingly, carrying the weight of my equipment on one shoulder was no problem to me, due to the well-padded straps. What is more, I hardly ever noticed the sling pack and I could totally focus on the fishing experience. Moreover, the water bottle is reachable without turning the bag around. Otherwise, if I cannot reach the bottle instantly, I am prone to forget drinking while being too absorbed with fly fishing. I hardly ever noticed the sling pack and I could totally focus on the fishing experience. When I need to change the rig, I just pull the bag in front of me. This way I have a platform to change the fly and tippet. Moreover, the attachment system is carefully tought out and well designed. However, there is one minor thing I would add: The possibility to attach a zinger with a nipper next to the Velcro patch because it is a bit of a hassle to attach the retractor pin to the Velcro. Nevertheless, this was a minor issue with this sample and might be adapted in the final product. Before being able to judge the durability of the Orvis waterproof sling pack, I need to test it for a longer period. Therefore, I have decided to take the sling pack on some travels before making a judgement. However, as far as I have tested the bag now, I am very pleased and do not doubt that it will last for a long time. Update durability: holds camera, Surface Pro 3, sunglasses, small drone, pullover and documents with ease – still in great shape. The Orvis waterproof Sling pack offers almost everything a fly fisherman can ask for. It is extremely convenient in usage, remarkably fast at hands, waterproof and has a well-thought out attachment system. What is more, the bag has a great design, which is not too salient in my opinion. Thus, I can highly recommend you this item. It will not disappoint you if you are looking for a waterproof solution that convinces with its great ease of use. If sling packs are not your cup of tea due to the pressure on one shoulder, the march 2017 collection from Orvis offers as well a hip pack and a backpack with the same waterproof system. The prize of this item is £199.00 and will be available by 11. of March 2017. 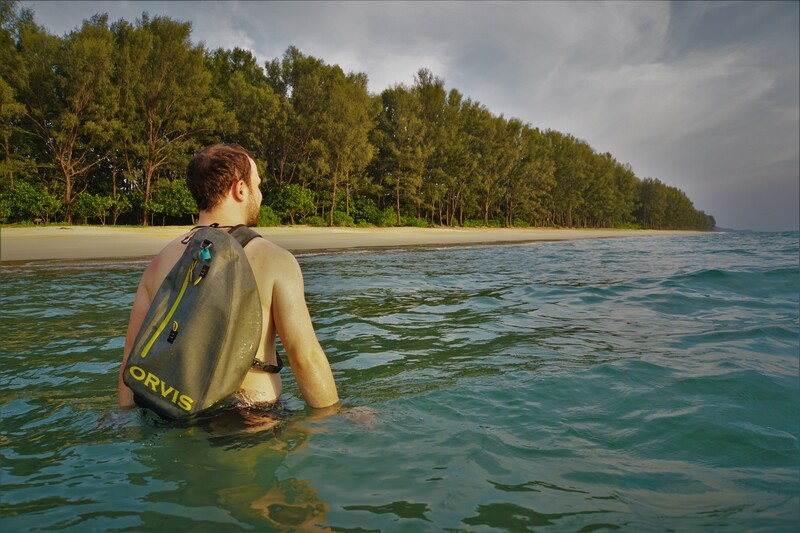 Do you have any questions about the Orvis Waterproof Sling Pack? That’s truely an interesting question. I have to admit that I have never fished with the Patagonia Slingbag, yet I wore it in a fishing store and had my hands on it. In my opinion the Patagonia one is a bit too large with 20 litres. Moreover, I felt that the waterproof zipper of the patagonia is smaller and therefore it is more difficult to fit things into the bag. However, from a budget perspective the Patagonia is less expensive and the brand is probably one of the best in the outdoor section concerning environmental friendly behaviour. In the end, I would recommend you to get your hands on both and choose what fits your needs best. P.S. Would you be interested in a Sling Bag shoot-out? I wonder to, i can’t find a review of them both. I can find a lot of reviews of the Patagonia, Orvis, Fishpond and Simms. But i can’t find someone who compare the sling bags, and i can’t figure out what bag is the best. Hi Robert, so far it did no fail at all and still savely carries my gear. Cheers and sorry to hear your dslr drowned. Great review. What is the make of the blue rod holder?